We’re proud to announce that we’re sponsoring the DVLA’s Code Challenge for 2018. The challenge enables pupils across Wales to develop their problem-solving, communication and teamwork skills, whilst improving their knowledge of programming and earning the opportunity to win thousands of pounds of IT equipment for their school. 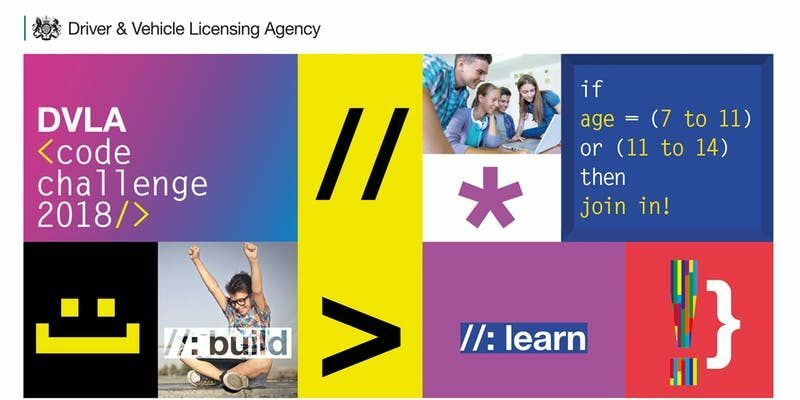 The DVLA‘s Code Challenge was first launched in 2017 to promote STEM subjects and IT learning in primary schools and community groups. Last year’s event saw nearly 200 children and 150 adults attending the event at the Richard Ley Development Centre in Swansea. Thousands of pounds worth of prizes were given out to over 50 primary schools and community groups. This year’s challenge welcomes a new age group, opening up the competition to children aged between 7-11 and 11-14. The event will take place on Tuesday December 4th at the Richard Ley Development Centre in Swansea from 10:00 – 16:00 GMT. “The DVLA Code Challenge was so successful last year that schools and sponsors enquired straight away about how they could sign up to the next competition, so we’ve decided to do it all over again. Registration for the event can be completed via the EventBrite website. Full information, including details of how to enter the challenge, is available on the DVLA Code Challenge website.